22 November 2013, at 12:00a.m. Tail-biting has a significant and greatly underestimated economic impact on the profitability of pig farming, Dr Dayane Teixeira and Dr Laura Boyle of Teagasc, Moorepark told the Teagasc Pig Farmers Conference in October 2013. In their study, the estimated cost of tail-biting per pig was €1.69. Suboptimal housing, management and stockmanship are associated with poor welfare in pigs and are reflected in disease, abnormal behaviour, injury, poor longevity and reduced productivity. Pig producers are caught in a dilemma driven by poor profit margins and the demand for cheap food on one side and the demand for high standards of animal welfare, environmental protection and food safety on the other. However, while maintaining high standards of animal welfare undoubtedly costs money there are also serious financial costs associated with poor welfare. This concept is central to the authors' current research, which aims to determine the financial costs associated with pig welfare problems on farm. Furthermore, this research aims to validate indicators of pig health and welfare measured on the carcass at meat inspection as a diagnostic tool for use by the producer and his/her private veterinary practitioner (PVP). Currently in Ireland, ante- and post-mortem meat inspection of pigs has the primary objective of protecting consumer health. However, valuable information on pig health and welfare could be gleaned from MI records and potentially contribute to reduced carcass losses due to condemnation and trimming as well as to improvements in pig health and welfare on-farm. Automated on-line recording systems for carcass and visceral pathologies as well as welfare lesions such as tail injuries are already in use in several countries including Northern Ireland. The studies related to this subject started in 2010 when data from over 36,000 slaughter pigs were collected from six factories in Ireland and Northern Ireland. In summary, this study provided preliminary herd-level data on tail-biting - scored according to severity on a five-point scale (Figure 1) - and carcass condemnation prevalence, associations and resulting financial losses. Over 99 per cent of inspected pigs were tail-docked, while 58.1 per cent and 1.03 per cent had detectable and severe tail lesions, respectively. Many differences were detected in the prevalence and reasons for carcass condemnations (CC) between abattoirs and judiciaries (Republic and Northern Ireland), which reflected variation in the criteria and methods of data capture used in meat inspection in different abattoirs. A second study was conducted in April 2012 based in one factory in Ireland. It looked at a wider range of welfare lesions and their relationship with carcass condemnations. In addition to the severity of tail-biting lesions, the prevalence and carcass condemnation/trimming implications of loin bruising (associated with excessive mounting behaviour) and hind-limb bursitis were also investigated. In summary, 3,422 pigs were studied over a seven-day period and overall, 72.6 per cent of pigs had detectable tail lesions, whilst 16.0 per cent and 44.0 per cent were affected by severe loin bruising and hind limb bursitis, respectively. Abscesses were the main cause of carcass condemnations and tail lesion severity was a significant risk factor for carcass condemnations. The other welfare lesions measured were not related to carcass condemnations. Subsequently, an in-depth economic analysis of the losses associated with tail-biting was completed. Losses associated with carcass condemnations and trimmings were calculated using the current average of Irish value for pig meat (€1.70 per kg). The losses associated with the 85 carcass condemnations in the study population amounted to over 1,800kg with a value of more than €3,200. This equates to €0.94 per study pig and increases to €1.10 per study pig if costs associated with the around 330kg of trimmings are included (Table 1). A negative relationship was also detected between tail lesion severity and carcass weight such that as the tail lesion severity score increased, carcass weights were significantly reduced. There was an estimated 1,181.7kg reduction in carcass weight associated with tail lesions scored greater than 1 (Table 2). This equates to €2.45 per study pig with a tail lesion score 2 or more or to €0.59 per pig in the final study population. 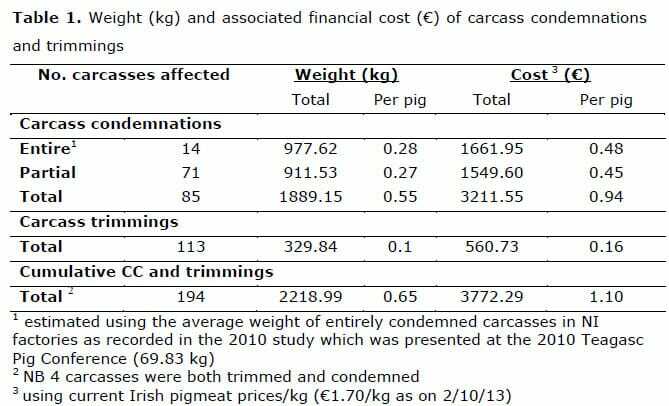 When added to costs associated with carcass condemnations and trimmings, the estimated cost per study pig was €1.69. What was particularly interesting about this finding was that even moderate tail lesion scores (i.e. tail lesion score 2) were associated with a significant 1.2kg reduction in carcass weight. Such lesions are not identifiable on the live animal and hence it would be very valuable to producers to receive such information from inspections of the carcass. PIGWELFIND is an acronym for ‘PIG WELFare INDicators’ (or ‘Finding Pigs Well’! ), which is a new project supported by funding from the Research Stimulus Fund of the Department of Agriculture Food and the Marine and involving a team of researchers from Teagasc, University College Dublin, Queen’s University Belfast and CAFRE (Mark Hawe). This three-year project will continue to investigate the potential for including indicators of pig health and welfare in the meat inspection process at pig slaughter factories. To date, semi-structured interviews with pig producers and stakeholders have been conducted. These aimed to establish perceptions on the current contribution of meat inspection methods, data capture and utilisation to the diagnoses of pig health and welfare and to determine opinions of stakeholders regarding the potential enhancement of meat inspection to improve its contribution to the diagnoses of pig health and welfare problems. The information is currently being analysed and the results will be made available in future Teagasc Pig Newsletters. Two controlled experiments are planned to establish how well the lifetime welfare of a pig is reflected in meat inspection findings and to determine how well the prevalence of welfare problems detected at slaughter relates to the actual prevalence of those problems on-farm. An experiment has also been devised to evaluate the impact of mixing prior to transport on sexual behaviour, skin lesions and loin bruises (associated with excessive mounting behaviour) of slaughter pigs. Further studies will estimate the financial implications for processors associated with downgrading of the value of the loin cut because of trimming due to loin bruises. Tail-biting has a significant and greatly underestimated economic impact on the profitability of pig farming. Work to date makes a strong case for including information on the severity of tail and other welfare related lesions on the carcass in the MI process and for transmitting this information to the pig producer to inform herd health and welfare management plans. Over the next few years, the PIGWELFIND project will provide the data to validate this approach. However, there ultimately needs to be an automated system to capture standardised information on carcass lesions available at meat inspection.